Despite the dullness of the weather yesterday afternoon, the bright sunny weather returned today [31 October 2015], and with the bright blue skies and temperatures that pushed to 16 above, this day was more like the ‘Indian Summer’ we enjoyed recently than the day before November. Despite the gloomy, dark ideas that can dominate Hallowe’en, this was like a Spring day, and I had no need for a coat and scarf or a hat when I went for a walk along the Promenade in Bray, Co Wicklow, this afternoon, and stepped down on the shoreline for a walk along the pebbles and the seashore. There were clear views out to the Irish Sea, north beyond Dalkey Island and south beyond Bray Head. Although there was no-one out sailing, about four or five people had braved the waters for a swim, and the ice cream parlours were doing good business. Two of us had a late lunch, including a glass of wine and double espressos, in Carpe Diem, which was decorated for a Hallowe’en party later this evening, before returning for another walk under the blue skies by the beach. We sometimes throw this question around as a challenge, a dare, and yet many of us face very real fears in our daily lives: fear of the future, of hurt, of betrayal, of death. How do we handle these fears? What can we do with them? This Hallowe’en night, all are invited to bring those fears and hold them up to see them in a different light. This alternative-style Eucharist will include an open prayer time for people present to engage with interactive prayer installations relating to our day-to-day fears. Prayer ministry will also be available for those who would like someone to pray with them about a need. As the invitation says, “Perfect love casts out all fear” (I John 4: 18). The Revd Jack Kinkead, Priest-in-Charge of Wicklow and Killiskey, is the preacher. 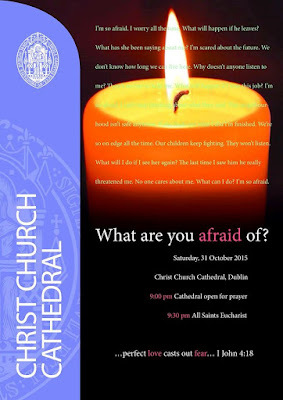 This service is an opportunity to experience something different than a typical Hallowe’en and to pray for the health and well-being of the city and country on a night that when there is often a focus on darkness and fear. Christ Church Cathedral is open for prayer from 9 p.m. this evening, the All Saints’ Eucharist is being celebrated at 9.30 p.m., and tea and coffee are being served in the Cathedral Crypt afterwards. It brought a smile to my face when I walked around Lichfield Cathedral after the mod-day Eucharist last Saturday [24 October 2015], and found that a hassock with the name of Comberford is still sitting comfortably although the church in Comberford village closed over two years ago in October 2013. The hassock represents a group of churches in the Tamworth Deanery, and it was not too difficult to find last Saturday afternoon. The other churches named on this hassock are Fazeley, Drayton Bassett, Clifton Camville, Two Gates and Hockley. It is just a year since Malcolm Fisher posted a short film of the church in Comberford on YouTube that illustrates the sadness created when a village church closes. On Friday 31 October 2014, he had to get complete strangers and their tractor to haul him and his car out of the mud. He felt he ought to say a prayer of thanks, and so he headed to the tiny village of Comberford, where he knew there was a tiny church dedicated to Saint Mary and Saint George. The church was built just after the World War I but held its final service two years ago on Sunday 13 October 2013 before closing its doors for the very last time. This was a Harvest Festival Service led by Bishop of Wolverhampton, the Right Revd Clive Gregory. The church was originally built in 1919 on land donated by the Paget family to the Lichfield Diocesan Trust for the erection of a mission church. The church closed despite the fact that the villagers and parishioners in Comberford and Wigginton Parish had raised £6,000 to repair the roof of the church after an unsuccessful National Lottery community grant application. The hassock in Lichfield Cathedral bearing the name of Comberford bears a logo with a Red Cross for Saint George embossed with a White Rose for the Virgin Mary, the two patrons of Saint Mary’s and Saint George’s. The village church in Comberford remains closed, its future is still uncertain, and the experience of Malcolm Fisher shows how its closure means the loss of many, uncountable opportunities for mission and outreach. During my visit to Birmingham last week [23 October 2015], I returned to the Pugin train when I was offered the opportunity of a private tour of Saint Chad’s Cathedral – Birmingham’s hidden jewel on the edge of the Jewellery Quarter. I have often seen this cathedral from the outside as I was passing through Birmingham on my way to or from Lichfield, but this was my first time to see the inside of this beautiful building with a remarkable history and a rich heritage. The cathedral was designed by AWN Pugin (1812-1852), the pioneer of Gothic revival architecture in England and Ireland. It was built between 1839 and 1841 to serve the rapidly expanding Roman Catholic population in Birmingham, and replaced an earlier Georgian classical chapel built by William Hollins in 1808. Saint Chad’s Cathedral stands in a public greenspace near Saint Chad’s Queensway, in central Birmingham. It replaced a smaller church dedicated to Saint Austin (Augustine), built on the same site in 1808, in the Gunmakers’ Quarter. It was designed in the north German 13th century style by Pugin, and was consecrated on 21 June 1841 by Bishop Thomas Walsh. Saint Chad’s is one of Birmingham’s architectural and artistic gems and has a large collection of mediaeval furnishings and carvings collected by Pugin. He was the pioneer of the Gothic revival in England and Ireland. Before he died in 1852 at the age of 40, he designed many cathedrals, churches and convents with their furnishings and contents in England, Ireland and Australia. Pugin was also responsible for much of the interiors of the Houses of Parliament in London. Three of his sons, Edward, Cuthbert and Peter Paul Pugin, also worked in Birmingham Cathedral. Saint Chad’s Cathedral is built of brick laid in Flemish bond, with Bath stone dressings and slate roofs. Brick was chosen for economy, allowing more resources to be deployed on the more important task of fitting out. The project received generous donations from John Talbot, 16th Earl of Shrewsbury, who was the last Roman Catholic to hold the title of Earl of Shrewsbury. The foundation stone was laid in October 1839 for what became the first Roman Catholic cathedral built in England since the Reformation. Saint Chad’s was the first large church that Pugin designed that was planned, from the outset in 1837, as a cathedral. Pugin lavished great care on the building. In his letters, he describes the architecture, decoration, fittings and furnishings in detail. The Clerk of Works and builder of Saint Chad’s was George Myers. The site for Saint Chad’s was steeply sloping land that fell away to the canal and wharf. Because of the narrow site, and the necessity to build in brick rather than stone, Pugin was restricted in the style and proportions of the church that he could design. The geographical alignment is unusual, so the liturgical “east end” actually faces approximately north-west. Pugin wished to make the church as open and spacious as possible, and so he looked to the style of churches built in Northern Germany in the late Middle Ages. Saint Chad’s is built like a brick hall church or hallenkirke, similar to Munich Cathedral, and has a westwerk with narrow broached spires similar to those of Lübeck Cathedral. The style has also been compared with other north German churches of the 13th century, including Saint Elizabeth, Marburg. Because of the steep slope on the site, Pugin built a large crypt underneath, to be used as a burial place for family tombs, and former cathedral clergy. Bishop Walsh buried in the crypt in 1849. Here too are buried Pugin’s second wife, Louisa, who died in 1844, and four generations of the Hardman family. However, the crypt is now a rehearsal room for the choir. The interior, where the nave is almost twice as high as it is wide, has a very high arcade, like German hall churches, carried on clusters of thin shafts. Those in the chancel are decorated in paint and gold leaf with helix-style patterns like a barber’s pole, bearing the words Sanctus Sanctus Sanctus Dominus Deus Sabaoth (‘Holy, Holy, Holy, Lord God of Hosts’). The wooden ceiling, with curving blue trusses, is ornamented with monograms and floral patterns, inspired by the remnants of mediaeval decoration found on the ceilings of Ely Cathedral and Peterborough Cathedral. Pugin designed or procured many of the fittings and furnishings, with the support of Lord Shrewsbury, including the high altar under an elaborate baldachin, with riddel posts, and the choir screen. The Bishop’s Chair, in oak upholstered in green velvet, and decorated with the diocesan coat-of -arms was also designed by Pugin. Other fittings, such the 16th century carved pulpit and the mediaeval canons’ stalls, came from churches in Belgium and Germany respectively and were collected and donated by Lord Shrewsbury. Lord Shrewsbury, who donated the stalls and a brass lectern, acquired abroad and the latter later sold by the cathedral. John Hardman father and son contributed to the cost of the rood screen, and high altar. The sanctuary windows are the work of William Warrington. Other windows, metalwork, fittings and vestments were provided by John Hardman of Birmingham, to the design or specifications of Pugin. Hardman was a parishioner of Saint Chad’s, founding the Cathedral Choir in 1854. Four generations of the Hardman family are buried in the family chantry chapel in the crypt. The south-west spire was added by Pugin’s eldest son, Edward Welby Pugin, in 1856 in memory of Canon John Moore, Administrator of the Cathedral (1841-1848). Saint Chad’s became a cathedral formally in 1852, two years after Pope Pius IX restored the Roman Catholic hierarchy of England and Wales. Cardinal John Henry Newman preached at the enthronement Bishop William Bernard OSB as the first Bishop of Birmingham. Bishop Ullathorne, whose monument is the cathedral crypt, was buried at Saint Dominic’s Priory, Stone. The plan consists of an aisled nave, western towers with spires, shallow transepts, short apsidal chancel flanked by the Lady Chapel and sacristies, a north baptistery with steps down to the crypt below. The north-west chapel was added in 1933. Pugin’s intended spire at the crossing was not built. His short sanctuary was insufficient for the building’s new status and functions, and in 1854 it was extended under the crossing by his son, Edward Welby Pugin, who brought forward Pugin’s roodscreen. EW Pugin also oversaw the addition of the south-west spire in 1856. The west front is symmetrical, with two thin towers with equally thin broach spires, that to the south-west completed in 1856 (EW Pugin). The northwest tower has a ring of five bells originally cast by Mears of Whitechapel and augmented by three by Blews of Birmingham in 1877, all recast by Taylors of Loughborough in 1940. The central main entrance has a doorway divided by a stone pier and a carved tympanum with the Virgin Mary and Christ Child and censing angels. Above this, a large six-light window with geometrical tracery and in the gable a spherical triangle window with trefoils. In the towers, the height of the paired windows is accentuated by integral niches, with statues of English saints. Many of the original furnishings have been lost, but Pugin’s high altar of 1841 survives. It was paid for by John Hardman Senior and Junior, who also paid for Pugin’s roodscreen. The high altar has riddel posts and an elaborately carved gable with cusped arch enclosing the relic chest of Saint Chad, with the crowning spire (Gerald Hardman) added in 1933. Below this, the tabernacle is by JH Powell (1878). The oak choir stalls and Pugin’s oak archbishop’s throne incorporate late mediaeval carved woodwork. This was traditionally said to come from Saint Mary in Capitol, Cologne but is now thought to be more likely Netherlandish, with carved figures and linenfold panelling. Pugin’s altar also survives in the Lady Chapel (1841), with carvings of the Presentation in the Temple, the Nativity and the Adoration of the Magi, and a contemporary reredos carved with the Virgin Mary and the Christ Child flanked by the Annunciation and the Visitation. The chapel also retains Pugin’s screen and parclose screen, and a 15th century statue of the Virgin and Child given by Pugin. The fibreglass statue of Saint Joseph is by Michael Clarke (1969). In the north transept is Pugin’s elaborate canopied Bath stone monument to Bishop Walsh, made by Myers and a ledger brass to John Bernard Hardman, who died in 1903. Pugin’s font, now in the north aisle, is octagonal and carved with the symbols of the evangelists. In the south aisle is a war memorial of by Gerald Hardman (1921), with a relief of the Deposition of Christ from the Cross and a memorial tablet to Archbishop Williams (died 1946), by GB Cox. Along both aisles, the Stations of the Cross are by Albrecht Franz Lieven de Vriendt of Antwerp (1875). In the nave, the hexagonal oak pulpit is now placed against the north-west crossing pier, moved there from the south side in 1968. It incorporates statues of Doctors of the Church, and was made by Pugin from one of ca 1520, obtained probably from Saint Gertrude’s Abbey, Leuven, and given by Lord Shrewsbury in 1841. The pews of Japanese oak were designed by GB Cox and date from 1940. On the south side, a 19th century wooden statue shows Saint Chad holding a model of Lichfield Cathedral with its three spires. In 1932-1933, Saint Chad’s was extended with the addition of Saint Edward’s Chapel, designed by Pugin’s grandson, Sebastian Pugin Powell, as a memorial for Archbishop Edward Ilsley, second Bishop and first Archbishop of Birmingham, and his patron, Saint Edward the Confessor. The altar in this chapel is by Gerald Hardman (1933). The chapel windows tell the stories of the relics of Saint Chad, and of those who have served the church there, along with colourful ecclesiastical coats of arms. Because the cathedral was situated in the Gunmakers’ Quarter, it was in a dangerous location during World War II. On 22 November 1940, a German incendiary bomb fell through the roof of the south aisle, bounced from the floor into some central heating pipes, and then burst. However, the water from the damaged central heating pipes put out the fire. The former Bishop’s House was demolished in 1960 to make way for the inner ring road. The house is recalled in windows in a passageway off the cathedral, and a chimney-piece and two chairs salvaged from the house are on display in the Victoria and Albert Museum in South Kensington. Although the cathedral was first listed in 1952, a major programme of reordering, redesign, repair, relighting and reheating was instigated in 1964 by Archbishop George Dwyer (1908-1987), and designed by the architects Weightman & Bullen of Liverpool and York. The sanctuary was rearranged to allow for more active participation by the congregation. The sanctuary was remodelled and extended to the chancel crossing. There was a debate about retaining the roodscreen designed by Pugin and restoring this to the original position in the sanctuary. But it was decided at the time that this would inhibit the free circulation around the new high altar and sanctuary. Pugin’s roodscreen was removed and the interior was repainted, to the detriment of the original design. The roodscreen was re-erected in the Anglican parish church of Holy Trinity, Reading. Other artefacts were removed to other churches, including the giant rood crucifix, which was removed to the Church of the Sacred Heart and Saint Therese, in Coleshill. Pugin’s tiled floors in the sanctuary were replaced with polished marble, and the organ was relocated the from the sanctuary arch to the west end, leaving a small choir organ adjoining the sanctuary. The internal damage was ameliorated in reordering and redecoration carried out from 1992 for Archbishop Maurice Couve de Murville by Duval Brownhill (now Brownhill Hayward Brown). As part of the restoration work, the giant rood crucifix was reinstated in the sanctuary, albeit without the attendant figures of the Virgin Mary and Saint John. The redecoration and reordering have also reinstated something of the colour and character of Pugin’s interior. The 19th century-style encaustic tile floors in the sanctuary are by H&R Johnson (1992), replacing the 1960s marble. The stone forward altar, pierced with cusped openings, dates from 1992. At the west end of the nave, the organ, built by JW Walker & Sons in 1993, has a painted Gothic case by David Graebe. One of the partners in Duval Brownhill at the time was Derrick Duval, a Chartered Architect who was the Mayor of Lichfield in 1982. Derrick and Pauline Duval live in Lichfield in the ‘Bogey Hall,’ their lovingly restored Grade 2 listed house in Dam Street, where I have been their guest. Saint Chad’s is the only cathedral in England to have the relics of its patron saint above the altar. As I was recalling during my visit to Saint John’s Hospital in Lichfield last week, pilgrims visited the Shrine of Saint Chad in Lichfield Cathedral for hundreds of years to pray for cures, and many miracles were recorded at the shrine. At the Reformation, the shrine in Lichfield was dismantled in 1538 and the bones of Saint Chad either destroyed or buried in an unknown location. However, one of the priests at Lichfield Cathedral, Canon Arthur Dudley, rescued a box containing some of Saint Chad’s bones which was kept in Saint Chad’s Head Chapel. He asked two female relatives, probably his nieces, Bridget and Katherine Dudley, who lived at Russell’s Hall, Dudley, to look after them. They in turn passed them on to two brothers, Henry and William Hodgetts, who lived at Woodsetton Farm at Sedgley near Wolverhampton. They divided the bones between them. William Hodgetts died in 1649 and his widow gave his share of the bones to Henry, who reputedly kept them hidden on the top of his four-poster bed. When Henry Hodgetts was dying in 1651 he received the Last Rites from a Jesuit priest, Father Peter Turner. During the Litany of the Saints, Henry began praying: ‘Saint Chad, pray for me.” When Father Turner asked why he was so devoted to Saint Chad, he explained he had some of Saint Chad’s bones in his possession. Henry Hodgetts handed the bones to Father Turner who wrote down all that Henry had told him about the relics and how they had come to him through the Dudley family. Father Turner had his statement witnessed by two other Jesuits and they had a new casket made, covered in red velvet and with silver hinges and locks, made for the relics. He then took the bones to the Seminary of St Omer, in Northern France, where he was based. The Jesuits later entrusted the bones to Basil Fitzherbert (1748-1797) of Swynnerton Hall, near Stoke-on-Trent, for safe-keeping. Basil died in 1797 and his widow and eight-year-old old son moved to a smaller house at Aston by Stone. There a chapel was built and served as Mass centre for the surrounding district. The family eventually returned to Swynnerton Hall, and Aston Hall and the chapel was closed. It is said that in the 19th century, the relics found their way into the hands of Basil Fitzherbert’s brother, Sir Thomas Fitzherbert-Brockholes of Aston Hall, near Stafford. When Sir Thomas died, his widow moved to a smaller house and their chaplain, Father Benjamin Hulme, found the dusty velvet-covered box of relics under the altar, including six bones wrapped in silk with Father Turner’s document. The bones were taken to Oscott, where they were examined by Bishop Walsh, the Vicar Apostolic of the Midland District, who was considering a suitable patronal dedication for his new cathedral, and his coadjutor, Bishop Nicholas Wiseman. A report was sent to Rome, where Pope Gregory XVI confirmed that these were the bones of Saint Chad and instructed that they be enshrined in the new cathedral being built in Birmingham. They were placed in a shrine designed by Pugin above the High Altar on the day of its consecration on 21 June 1841. The shrine, which Pugin based on the Venerable Bede’s description of the original at Lichfield, was further embellished by Hardmans in 1931. In 1995, Archbishop Maurice Couve de Murville arranged for a fresh examination of the bones. Carbon dating analysis by the archaeological laboratory at Oxford University concluded that one of the bones dates from the eighth century, and so cannot belong to Saint Chad. The other five all date from the mid-seventh century, which concurs with the death of Saint Chad on 2 March 672. But two of the bones are left femurs and so are of different people. Perhaps one, if not three, of the bones are those of Saint Chad. But the bones are still kept together and venerated collectively. Saint Chad’s Cathedral stands in a green public space in Birmingham, near Snow Hill station, in what is now called St Chad’s Queensway after the cathedral. It is at the junction with Snow Hill Queensway and Old Snow Hill and Constitution Hill, part of the Birmingham Inner Ring Road built in the 1970s. Saint Chad’s is on the north side of the road, which divides the cathedral from the city centre. To mark the centenary of Saint Chad’s Cathedral, Pope Pius XII declared it a minor basilica in 1941. Saint Chad’s is listed as one of Birmingham’s most significant buildings in the recent Pevsner Architectural Guide to Birmingham by Andy Foster. It also features in ‘A Glimpse of Heaven,’ a survey of the best 100 Catholic Churches in England and Wales published by English Heritage, in conjunction with the Catholic Bishops Conference of England and Wales, in 2006.